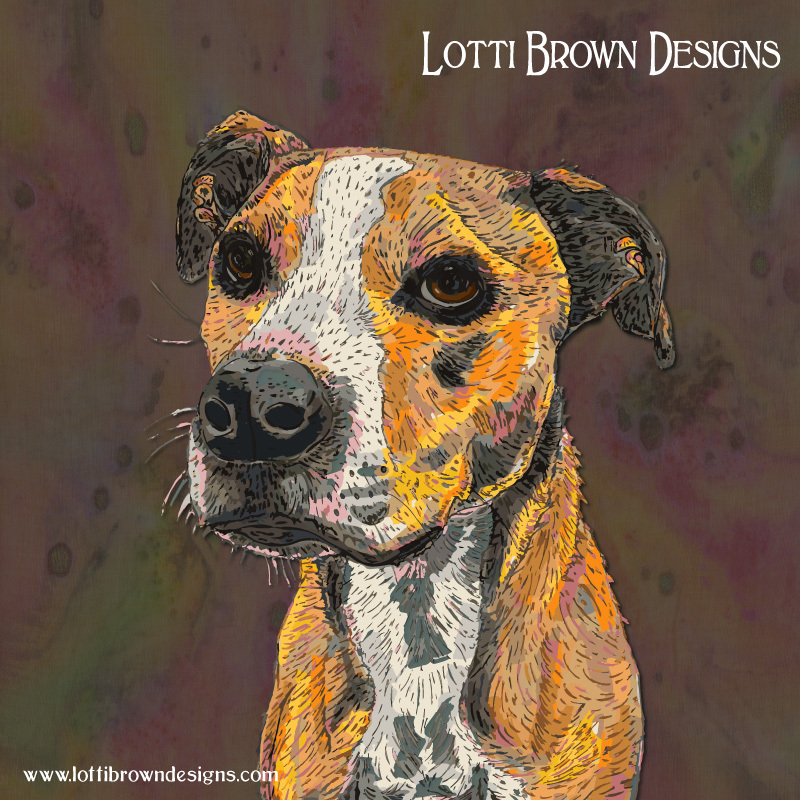 Choose Lotti Brown’s custom pet portraits from photos to celebrate the special bond between you and your pet. Do you want to celebrate your furry friend being part of your family? Or are you looking for the perfect personal gift for someone really special - something unusual, something that will make them beam with pleasure, something that shows how much you care? When a pet shares your home, they become a treasured part of your family. You get to know their little quirks and foibles and begin to really understand and appreciate their unique personality. Whether you are ‘parent’ to a devoted dog, or have been volunteered into the role of head housekeeper to a cuddly cat, you and your pet share a very special bond. You belong to each other. 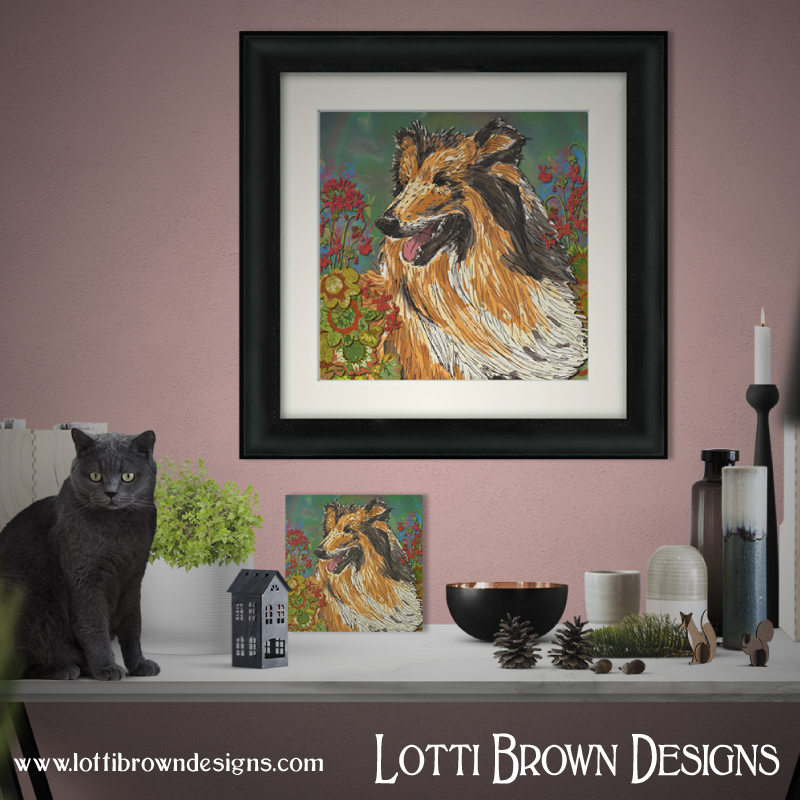 It is this very special connection that I create my pet portraits to celebrate – the way your pet looks at you, and what your pet means to you. It’s not just your pet. 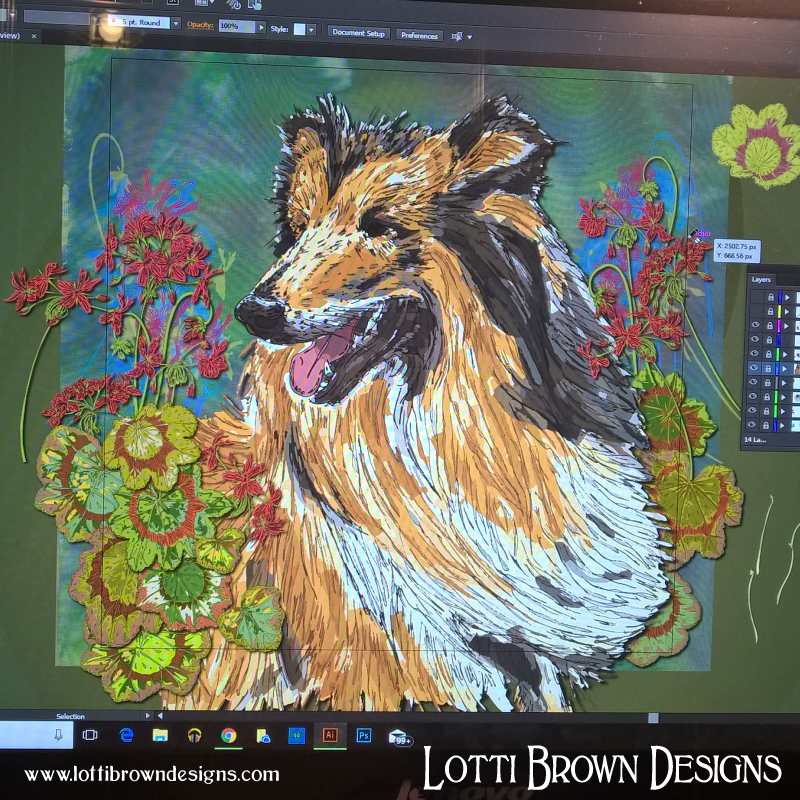 I can include additional detail in the pet portrait, such as flowers, foliage, scenes or patterns which reflect the special bond between you and your pet. Perhaps a treasured memory, a personal meaning, or a quirky style. It is this that makes your pet portrait extra special. “I can’t thank you enough, Lotti, for this absolutely amazing picture of my special ladies. You have captured each of their expressions exactly. How do the Custom Pet Portraits Work? I can create your contemporary pet portrait from a photo. I use a digital photo that you provide. We can choose one together and talk about what will work best. I draw your pet with pen and ink. If required, I separately draw flowers or other elements that have meaning to you or the recipient, or that just look pretty, to include in the artwork. 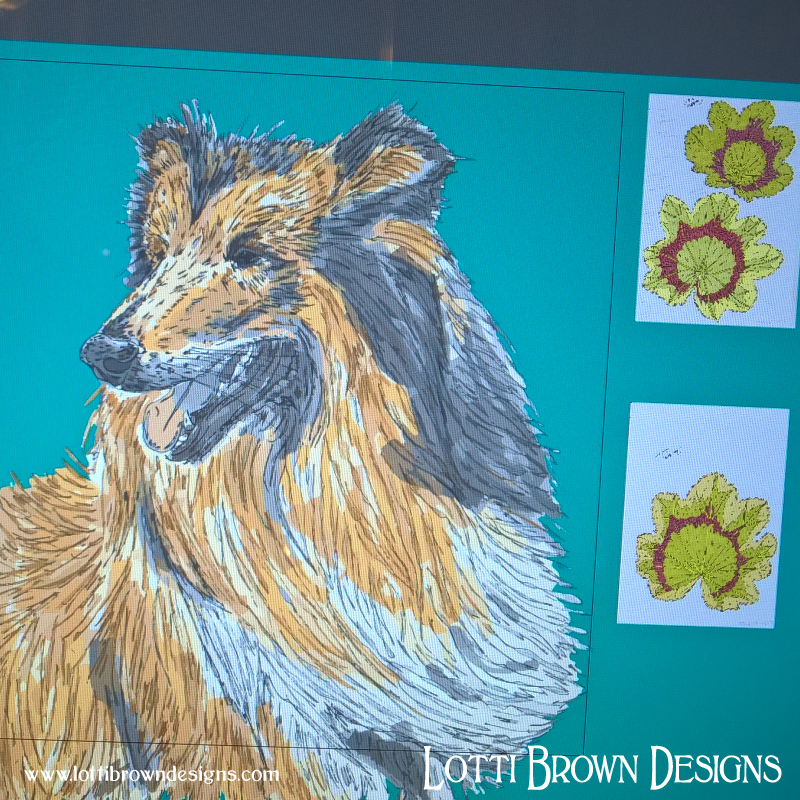 I scan my drawing into the computer and use a digital illustration programme to combine the pet drawing with a hand-painted background and other drawn motifs, in order to create the final artwork. The completed artwork will be sent to you ready to hang as a framed and mounted high quality fine art giclee print. And a high-resolution digital version of your artwork which you can use as a screen saver or get your pet portrait printed onto cushions, bags, phone-cases and more (for your own personal use only – not for commercial use without a licence from me). 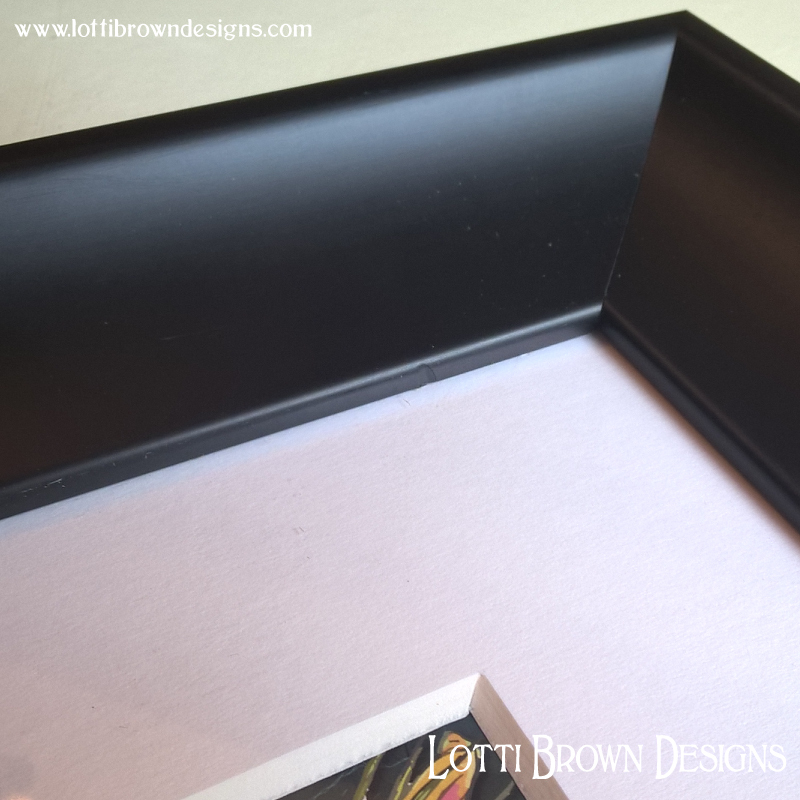 My frames are a beautiful solid wood black frame with a subtle curved frame to draw attention to the artwork. These are individually handmade for your order and will arrive ready to hang with all backing fixings and hangings already in place.. The frames are beautiful solid wood with a smooth black finish. The frames are of sturdy construction with MDF backing, precision built and fitted with acrylic plexiglass glazing for safety, increased UV protection, and reduced glare. Your artwork is mounted in a 2mm-thick, white mount of conservation-grade quality. Your artwork is printed with the giclee technique on 280gsm, museum-quality, fine art paper and with archival quality inks which are resistant to fading over 100 year period (in optimum conditions) and give superior colour reproduction and a rich finish. More details about materials and techniques used in the framing here. Prices are quoted for framed pet portraits using the above frames. But if you already have a favourite frame in mind or would like to choose your own frame, I can send the artwork unframed and unmounted (sent rolled in a tube – ideal for overseas delivery). Please just ask when you request your quote. "I gave my friend her picture yesterday at long last. I have never seen anyone so thrilled. They love it. So many thanks once again." When you order your pet portrait from a photo, getting that 'just-right' photo of your pet is very important. As much as we might wish differently, a poor photo does not translate into stunning art. 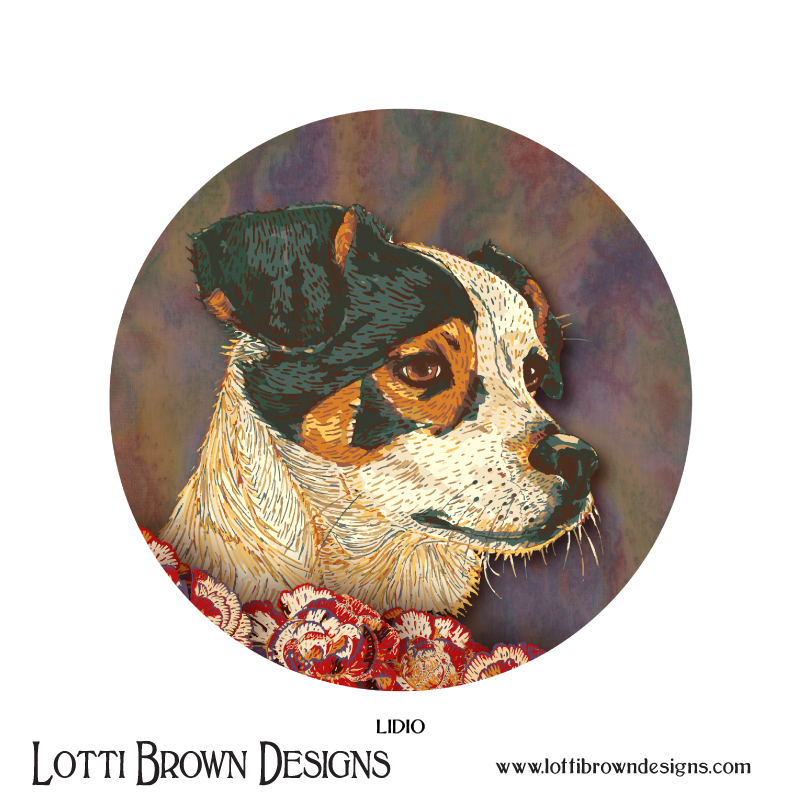 A charming, close-up photo where your pet has a winsome expression will help to make your final artwork so much better. If you've got a perfect pic in mind - great! I'd love to see it. If you're not sure, please ask me if your photo is suitable - it won't commit you to anything whatsoever. I create pet portraits in two styles. 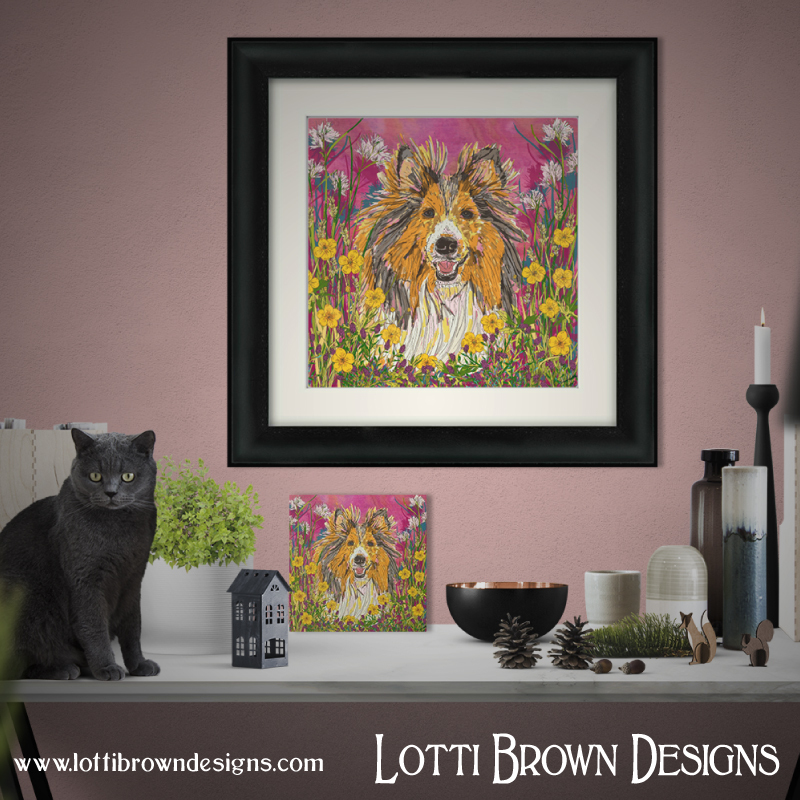 My artistic style is what you see in my pet art gallery, where the pet portraits are colourful, detailed, and come with a floral or patterned background. I love creating this style as I really believe it allows me to create a very personal and meaningful pet portrait for you. Your artwork is just for you – I don’t sell prints of your pet. Additional postage charges will apply depending on your location – sample postage charges to the UK are shown below each example. International delivery is available. 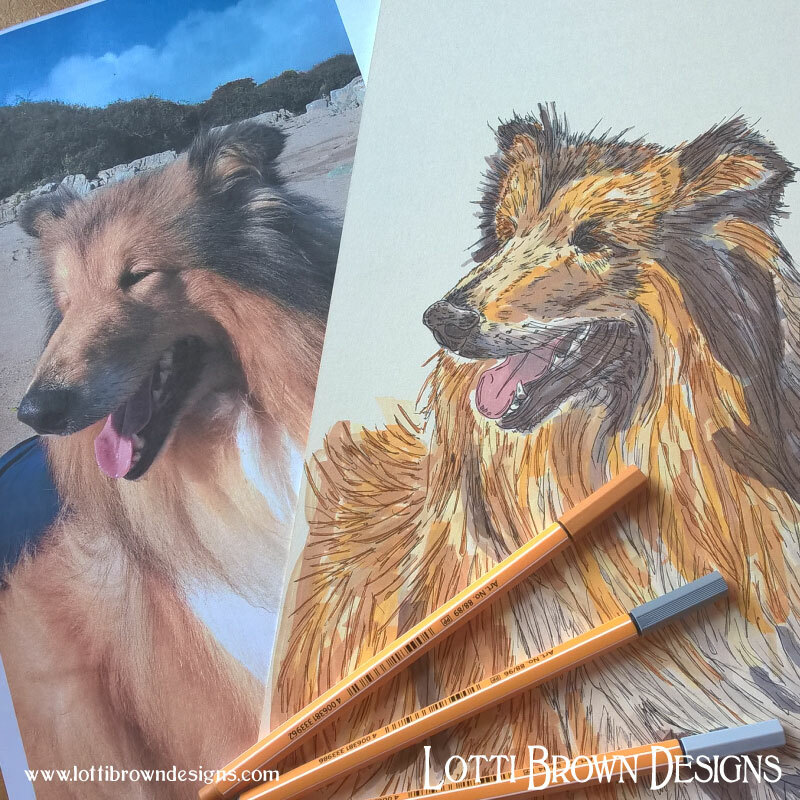 Custom pet portraits usually take between 4 and 8 weeks to create, which allows time for us to discuss your requirements, and then a further 1 to 2 weeks for your artwork to be printed and framed. Delivery time will also need to be added which will vary as to your location. The time taken can also vary depending on how quickly you are able to reply to my questions. Please be aware that this timescale estimate may be increased at busy times when I must prioritise those customers who ordered first. I can supply you with a timescale estimate before you order. If you've got any questions after reading everything, please just ask. You can contact me here or through the form below. Please use the form below to contact me and tell me about your pet and what you'd like from your custom pet portrait. Please tell me about your pet and any initial thoughts or ideas you have about your custom pet portrait. There is no facility for sending photos with this form but I will need to see your pet photos, so please have a few good photos (ideally around 4) ready to send me when I reply. Thank you for sending your enquiry. I’m currently taking an extended break away from the computer to relax and spend time with family. I’ll be back on Tuesday 7th May 2019. I apologise for any delay in my reply. 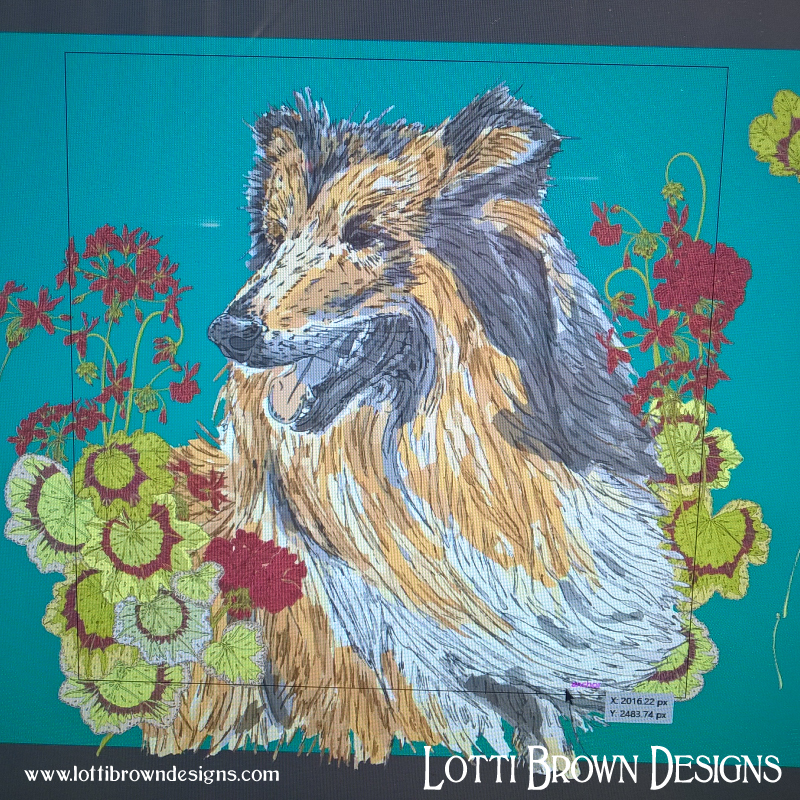 Please whitelist @lottibrowndesigns.com to make sure you receive my response. Thanks for sending me your information. I will be in touch soon, usually within a few days. Please, have your photos ready to show me when I reply.